German supermarket giant ALDI opened today at the South Fremantle Marketplace on the corner of Douro and Hampton Road. Parking bays were hard to find but it was quiet inside the supermarket when I went for a look at midday. I bumped into a very excited English lady who gushed about cheap German beer for only $ 8.00 a six pack. I was delighted to get a Dutch rookworst for only $ 2.99 when they are $ 9.00 at Woolies and bought fresh Australian salmon for about $ 4.00 less than I normally pay elsewhere. I did not have too much of a look around but noticed a giant 58″ high definition TV for only $ 499.00. Nice touch to have special close-by parking for those special parents with babies. The Fremantle Council’s Planning Services Committee will on Wednesday deliberate if it will follow the officer’s recommendation and ask the State’s South-West Joint Development Assessment Panel to reject the application by German- based ALDI to develop the shopping centre site on the corner of South Street and Ethelwyn Street in Hilton, because the new giant supermarket would turn its back to South Street. The officer believes the development proposal by Aldi is detrimental to the amenity of the area in relation to the lack of street-level pedestrian based activity as it presents to South Street. The new development would more or less show its bum to South Street with a blank wall and airconditioner units and not integrate with the IGA supermarket on the other side of South Street. 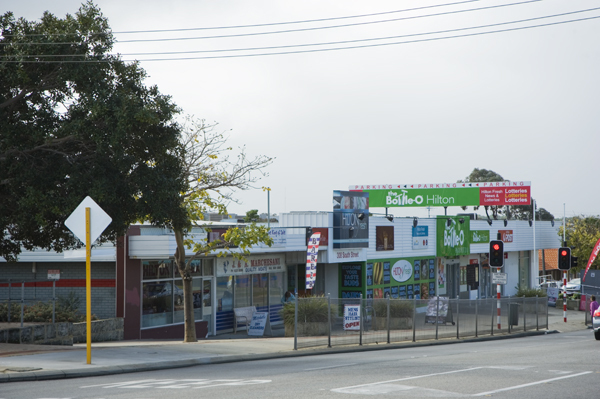 The Chair of the City of Fremantle’s Design Advisory Panel suggests to turn the development by 90 degrees so the entry to the ALDI supermaket would be at the corner of Ethelwyn and South streets and open up opportunities for both streets to develop into a shopping precinct. He also suggests a multi-storey mixed development would be better and in line with plans the COF has for the area. South Street in that vicinity is also earmarked by Mainroads for widening, so it is imperative that integrated plans for the Hilton area will be made instead of piecemeal bit by bit planning and development, as a pedestrian overpass or tunnel might well be appropriate if the area develops into a residential and commercial precinct. I believe the suggestion to turn the development so it interacts better with South Street is good and ALDI should take it on and create a better and more substantial building there. The ALDI mega market development proposal for Hilton is very disappointing, but because it will most likely be approved by the State’s Development Assessment Panel(DAP) the City of Fremantle can do little about it but stating they don’t approve of it. The location is the shopping centre at South Street opposite IGA where there is a newsagent/postoffice, butcher, fresh market, etc. ALDI proposes to make it into a giant supermarket at ground level only that turns its back to South Street and will create a large blank wall along the busy street, while the area along South Street is earmarked by Fremantle council for residential development and higher density, so the development should have a 3-4 storey residential development on top. Mayor Brad Pettitt rightly argues that there also could be a wrap around of small retailers to make the street level appearance more attractive, especially along South Street. A newsagent with postoffice, hairdresser, a deli, etc. would do well in that location I believe. ALDI will no doubt mean huge competition for the very popular IGA at Paget Street and smaller retailers in the vicinity, but that is hard to stop. What should be stopped though is an inappropriate and ugly street level only development that is not going to enhance the amenity of place in Hilton at all. 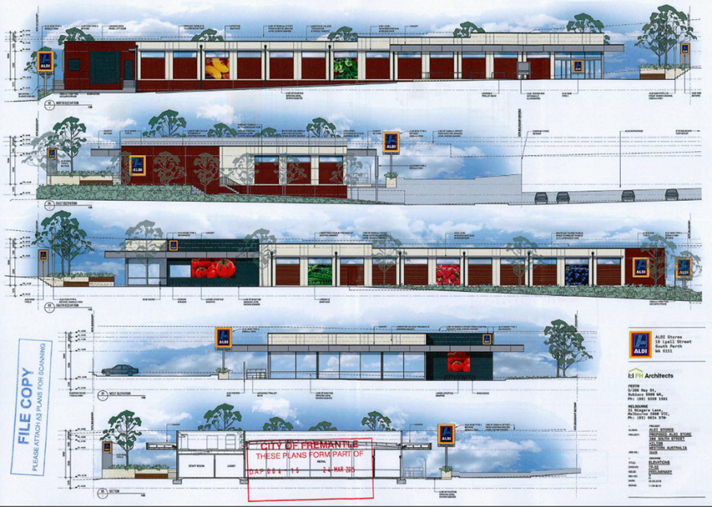 The proposal is old-fashioned and unimaginative and a giant like ALDI can do and can afford to do better.